As you leave the Town Hall Car Park by the bridge over the Burn, you are roughly following the path of the original main road into Dalbeattie. Before the bridge was built on the High Street, the principle route into Dalbeattie and it’s industrial area around Mill Street was via Water Street, which today only remains as the short road into the car park. However it used to continue through the Burn and on into Mill Street, it’s course today followed by local footpaths. The Ford through the Burn at Water Street was one of the reasons the town of Dalbeattie grew up situated here in the first place. It was the only crossing place on the Burn as you travelled the main coastal route through Galloway and enabled travellers to access a Ford on the River Urr, by the Moat of Urr, further north of the town. Even after the High Street Bridge was built shortly before 1850, the Ford at Water Street continued to be an important route for the town. Right through the 1900’s, until the flood defences were put in place and this new bridge built in the late 1970’s, local children would play down here in the shallow water and on the huge Granite Boulders that were the “Stepping Stones”. The “Stepping Stones” are fondly remembered by locals and their loss is still mourned, though not by local mothers who had the worry and extra work of soaking wet children who frequently fell off them into the Burn. Colliston Park spreads out before you, a tribute to far sighted local benefactors who devoted a great deal of time, [10 years], money and effort into providing Dalbeattie with one of the most attractive Public Parks in the region. Miss Copland of Colliston, after whom it was named, gifted the land that it occupies to the town in 1900. 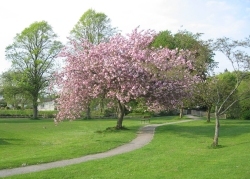 The Burgh Council of the day had set up General Improvement Committee, chaired by Mr Josiah Ferguson, in 1898, and the Burgh Surveyor, Mr Robert Wilson, a local joiner, along with Mr J M Austin, were the driving forces behind the fund raising efforts put in to raise the money to lay out the park. Mr Robert Wilson is credited as being the architect of the planning and design of the Park. The land was originally rough, boulder strewn and boggy, and work started by filling in and levelling the ground, with local farmers bringing cart loads of rubble and soil from their own land. It was at this stage that the pond and island were constructed. The next improvement was the erection of Bridges over the Burn. The iron Latticework Bridge that connects to John Street and forms the main entrance to the Park was constructed in 1902 by Dalbeattie Blacksmith Robert Erskine, a commemorative plaque can be seen on the bridge. A wooden bridge leading to the far exit of the park onto the Barrhill Road was also put into place. Shortly afterwards Drinking Fountains were put in, though they have long since disappeared due to public health issues. 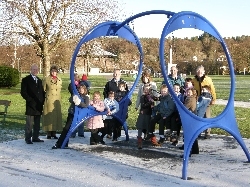 Children’s swings, seats and finally the large Octagonal Bandstand were added to complete the Park. 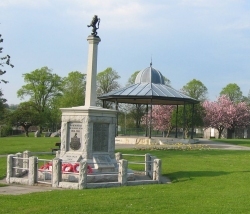 Another local joiner, and nephew of the Burgh Surveyor, a Mr James Maxwell Wilson, built the Bandstand. 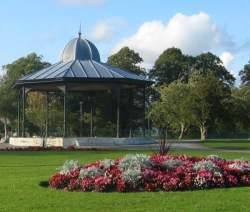 The uprights of the Bandstand are formed from old Gas Street Lights, bought from Glasgow City Council, when electric street lighting was being put into the city. Finally a further bridge was put in place between Colliston Park and “The Daniel”, a piece of land gifted to the town by Mr W J H Maxwell of Munches, which had been the local Cricket pitch. This land is now the site of our Youth Club. As you walk around the park today, you will find it substantially unchanged from when it first opened in a Grand Official Opening Ceremony on the 18th July 1908. The day marked the Official opening of Colliston Park and also commemorated the 50th Anniversary of Dalbeattie becoming a Police Burgh. The main addition since is the Granite War memorial, commemorating the dead of the two World Wars. It was erected in 1921 and unveiled by local man Mr William Duncan Alexander* who was blinded at a very young age during the first world war whilst serving at Vimy Ridge in France . 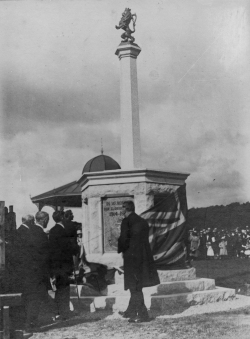 The first Remembrance Day service was held at the Memorial in November 1921. It is made of local grey granite, an octagonal base supporting a column topped by the Lion Rampant of Galloway. It is a simplified version of the Mercat Cross in Edinburgh. Poppy Wreaths are still laid there today by various local groups on Remembrance Sunday. New Children’s play equipment has been added, and the paddleboats that are for hire on the lake first appeared around 1960. A good floral display is maintained and trees have been planted and flourished over the years, with extra seating so you may rest and take in the views. A Putting Green has been created, and clubs and balls can be hired from the boat shed in summer. A tennis and multi-purpose court, with Clubhouse, complete the facilities on offer. Football is catered for with a pitch marked out in the Park and the Islecroft Stadium, home of our local football team, Dalbeattie Star, is situated at the edge of the Park, next to the Car Park. The building of Islescroft Stadium was financed by local fundraising in the 1950’s. The walkway around the park continues behind the Football Stadium, alongside the burn where you may, if you are lucky, see Heron and Otters, as well as fish in the clear waters. Follow the path along the field, which is now the Sports Field for the local Primary School, that you will see up on the hill to your right. The Primary School was first built in 1876 as the town’s High School. Additions have been made to the buildings over the years, in 1900, 1911, 1962 and 1980, and it became solely a primary school in 1953, when the High School was built on the edge of the town. The oldest part of the building is the Hall with it’s imposing Octagonal Bell Tower, said to be home to a colony of bats! The walkway ends at a flight of steps up to the Barr Bridge. Those with limited mobility may prefer to retrace their steps back through the park, and perhaps walk along Mill Street to the shops on the High Street. Others may continue up the steps and down Southwick Road, past our local Museum again ending at the High Street, perhaps taking a detour into our Forest via one of the many way-marked walks. *Despite his blindness, Mr Alexander or "Old Duncan" as he was known, married, raised a family and kept poultry until a ripe old age. Old Duncan was a very well known and loved character in the town. After his wife, Jenny, died suddenly in the 50's, old Duncan was cared for by his daughter, Nancy. Nancy passed away in 1989, and both are greatly missed by his grandson and namesake William Duncan Alexander who was raised by them and who contributed this information about his grandfather.